Sutton Hall & Lodge were delighted recently when they were visited by some very special and very unusual guests. 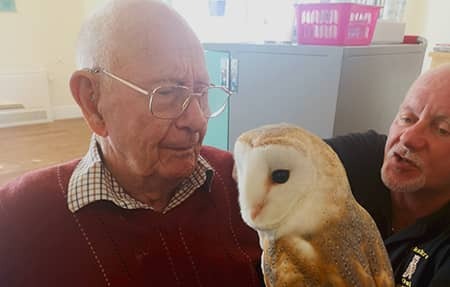 Five beautiful owls swooped into the home (along with their handler of course) and residents had the opportunity to learn all about and even handle the different varieties of owls! 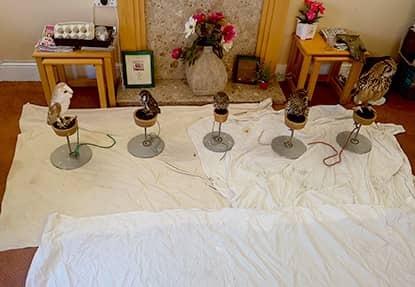 Out of the five different owls, there was one that was a clear favourite for everyone… Charlie, the Little owl, (Yes, ‘Little owl’ is the actual name of this type of owl!) Everyone had the chance to hold and pet this adorable bird and everybody soon fell in love! 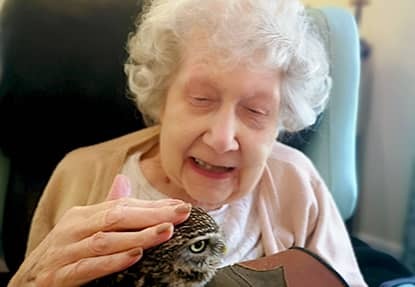 “Wow, I can’t believe how soft his feathers are… can we keep him?” commented Sheila, a resident at Sutton Hall & Lodge. As well as Charlie, the Little owl, there was another bird that caught everyone's attention… Casper, the enormous Indian eagle-owl! Casper swooped across the room with his huge wings. He was so big, he caused a big gust of air when he flew by! “Casper was beautiful, what an amazing creature!” exclaimed Hilda, another resident at the home. “This has been a very successful activity, that all of the residents engaged with. They were all amazed by the birds and are already wondering when they can next come back to visit”, said Nicola Hartley, ones of the homes Activities Coordinators.